VIE 02/01/17 – 03/31/17 TYO is comprised of a collection, selection, and recombination of graphical elements gathered during a journey to Japan. Franz Thalmair photocopied, manipulated and manually reproduced all found materials. 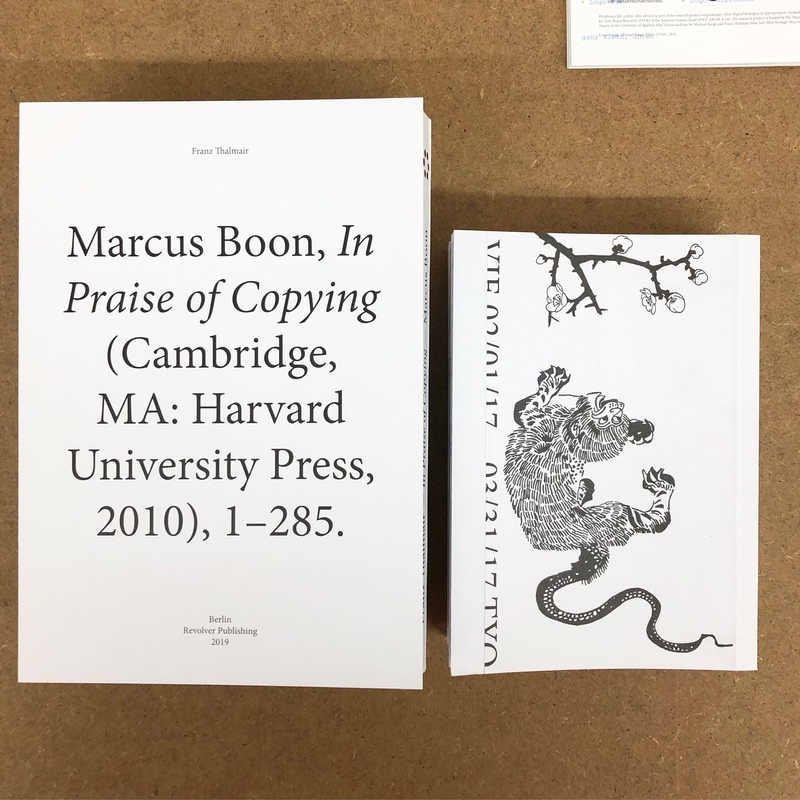 Originally written by Marcus Boon, the book „In Praise of Copying“ was first published by Harvard University Press in 2010 under the „Attribution-ShareAlike“ Creative Commons license. Franz Thalmair has reproduced most of this book manually now. The books are part of the artistic research project „originalcopy – Post-Digital Strategies of Appropriation“, which runs from 2016 to 2019 at the University of Applied Arts Vienna, and sheds light on the practice of copying from a post-digital perspective. The research project focuses on the tensions between the supposed immateriality of digital technologies and their material manifestations by appropriating contemporary methods of copying and exposing them to artistic processes of transformation and translation. originalcopy is funded by the Program for Arts-Based Research (PEEK) of the Austrian Science Fund (FWF: AR348–G24). The research project is hosted by the Department of Media Theory at the University of Applied Arts Vienna. originalcopy is run by Michael Kargl and Franz Thalmair from July 2016 through December 2018.